The primary purpose of this web site is to assist those who are doing research on their Killough ancestors and contemporaries. 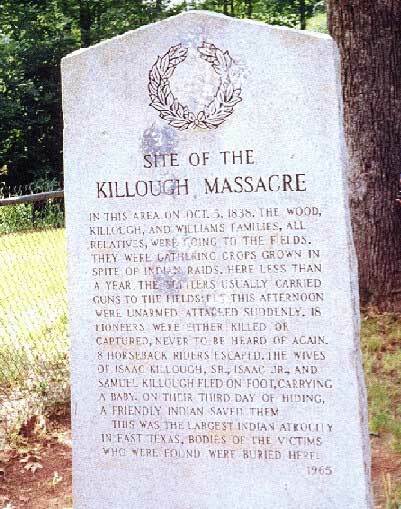 It is provided by the Killough organization that meets every other June in Jacksonville, Cherokee Co., Texas. This is near the site of the 1837-38 settlement of Killough families in what was then Nacogdoches Co., Republic of Texas. News of the reunions will be updated from time to time. Anyone connected in any way to the Killough name is invited to participate or just watch what's going on. Visit the History of the Texas Killough Reunion page on this site. For genealogical questions, updates, etc., please refer to the list of Assistant Historians on the Announcements Page.